Community toolkits give you resources to educate the groups you work with and the people you speak to about the dangers of opioids and how to become part of the solution. We all have a role to play in ending the opioid epidemic that’s devastating our site. Community toolkits give you resources to make your own – ways to educate the groups you work with and the people you speak to about the dangers of opioids and how to become part of the solution. Share facts about the impact of the opioid crisis in North Carolina and the country, and what’s being done to address it. Finalize a formal resolution about your organization’s involvement in the More Powerful NC campaign. Use the resolution’s options to decide what actions you will take to address the epidemic in your communities. Print and distribute 6” x 4” take back cards at events and within communities to remind people to safely dispose of unnecessary and leftover medications, keeping them off the street and away from the wrong hands. Print 8.5” x 11” or 11” x 17” posters to display in high-traffic areas in your communities. Post about the dangers of opioids, the impact of the epidemic, and encourage community members to take action through Facebook and Twitter social posts. 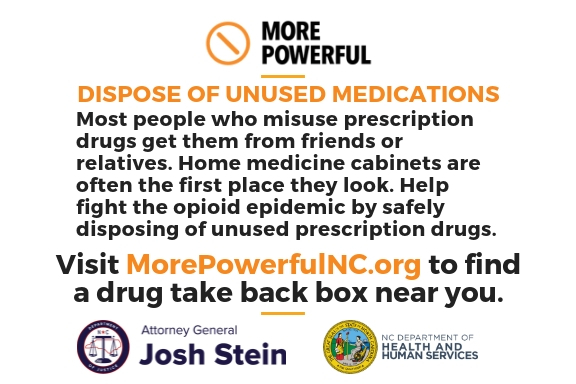 Don’t forget to use #MorePowerfulNC in your posts, and tag the North Carolina Department of Justice and the North Carolina Department of Health and Human Services. There’s no template for writing a letter or opinion piece for your local newspaper, but you can take a minute to share your thoughts about the impact of the epidemic on your community, and what we all can do to help end it. Buy print ad space from local community newspapers and magazines to raise awareness about the campaign and encourage action. Buy and place digital media ads on local news websites or other websites that are relevant to your community.